National Forensic Science week comes to a close on September 22, and the activity surrounding forensic science on the Rutgers–Camden campus has never been busier. 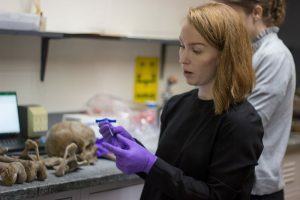 The Arch Street Project, the recovery and analysis of human remains uncovered during a construction project in Old City Philadelphia in 2017, has been growing in both its scope of work and network. Dr. Beatrix Dudzik explains the technique to sample bones, looking for biomarkers to determine time since death. Dr. Beatrix Dudzik, Assistant Professor of Anatomy, of Lincoln Memorial University in Tennessee, became aware of the Arch Street Project through Instagram. Her research partner reached out to Kimberlee Moran, Associate Teaching Professor of Forensic Science and the lead on the Arch Street Project, and it was, as Ms. Moran says, “the beginning of a beautiful collaboration.” Dr. Dudzik samples the bones, looking for biomarkers to help determine time since death. Through a grant at the National Institute of Justice, Dr. Dudzik has also been researching the molecular make-up of lipids in brains, and has been able to examine the preserved brains discovered among the bones found in the former burial ground of the First Baptist Church of Philadelphia. Ms. Kimberlee Moran and Arch Street Project student collaborators review the bone cleaning process. 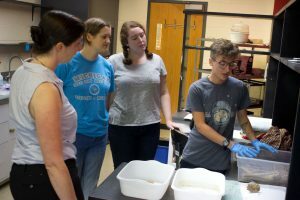 Dr. Maja Seselj, Assistant Professor of Anthropology at Bryn Mawr College, began her involvement in the project last year, after having been away on research leave during the initial excavation. Dr. Seselj is leading a group of six students from Bryn Mawr College and Haverford College who have been assisting on the project as part of experiential learning courses. These students join students from other schools, including Rutgers–Camden, Camden County College, The College of New Jersey, and the University of Pennsylvania, as part of the Arch Street Project team. A biological anthropologist, Dr. Seselj and her students are helping with the cleaning of the bones, with the next step a full analysis of what has been recovered. The team has until 2023 to work on the project; 2023 is the new deadline for when the bones will be re-interred at Mount Moriah Cemetery in Southwest Philadelphia. In the meantime, Ms. Moran and Rutgers-Camden students will exhibit their discoveries in a student and alumni networking event called “Bones and Brews: The Forensics of Networking,” which will take place at the Arch Street Meeting House in Philadelphia on October 11th. This page was printed from http://fas.camden.rutgers.edu/2018/09/21/arch-street-project-continues-work-gains-collaborators/ at 1:37 AM Monday, April 22, 2019.